After much excitement at the Oscars we decided to share our five favorite jewels worn by celebrities. We even decided to throw in a suggestion for our beloved Jennifer Gardner. Brad Pitt knows he made the right choice wearing a bold and distinguished looking ring beside his wife Angelina Jolie who wore 42 carats of diamond earrings that perfectly accented her dress. Penelope Cruz made a perfect choice for the Spring season wearing flower shaped diamond and platinum earrings. Amy Adams wore a wedding favorite, Tiffany bracelet made of yellow diamonds that complemented her navy dress. Although Olivia Wilde’s pregnant glow would have been sufficient Jewelry for the Oscars we are a big fan of her diamond chandelier earrings since they are not flashy and allowed us to appreciate her beauty as a whole. Lupita Nyong’o wore an 18kt yellow gold and diamond headband as well as matching earrings to solidify her pure and angelic look. We love the “snowflake” necklace Naomi Watts wore that reminds us of this past winter’s polar vortex (Frozen anyone?). 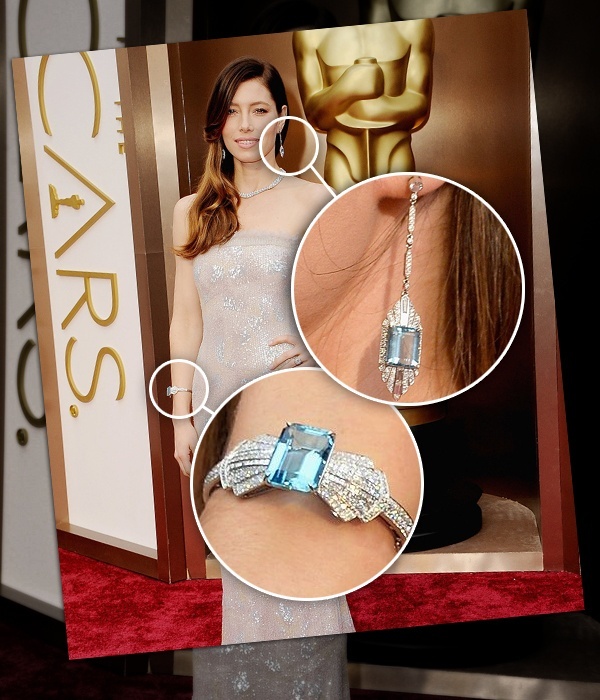 Jessica Biel made a great choice with the aqua colored Tiffany earrings and matching bracelet made of platinum. Charlize Theron wore a 31 carat diamond necklace which gave her a very simple yet classy look. Here at brilliance we make all types of Custom Diamond Jewelry (like the sapphire blue ring above), feel free to contact our jewelry experts for a quote 866-737-0754.